One of my goals this year was to teach my kids, age 4 and 4.5, about the American Thanksgiving holiday. I want them to know that the first Thanksgiving was celebrated by the Pilgrims and Indians more than 300 years ago. I want them to know what food are typically eaten at Thanksgiving. And I want them to learn how and why we continue to give thanks each November when we celebrate Thanksgiving. Among doing other Thanksgiving activities for kids, we’ve read a lot of books about Thanksgiving. I really believe that books are one of the best way to help kids understand abstract concepts like historical and cultural events. 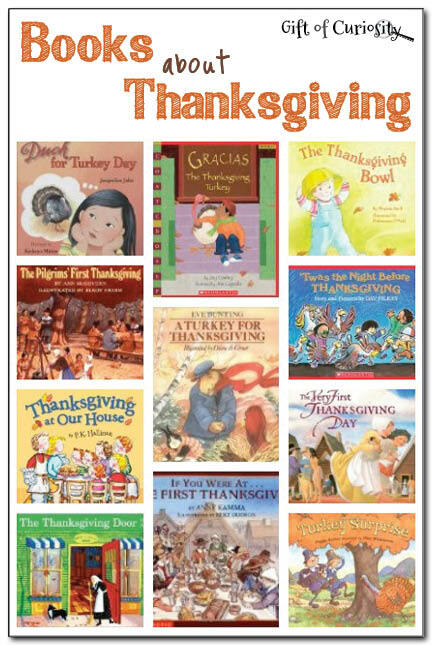 Below is a list of books about Thanksgiving that we’ve read and enjoyed. A wonderful introduction to Thanksgiving for preschool and early elementary children, this book gives an accurate historical account of the events leading up to the first Thanksgiving. Children will be fascinated by the hardships endured by the Pilgrims on their long voyage to the new world and in setting up their new homes. They will be intrigued to learn that the first Thanksgiving lasted a full three days. And they will enjoy the beautiful illustrations that accompany the clear text. This book is more appropriate for elementary students than for preschoolers. But for kids of the right age, it provides a fascinating look at life during the time of the first Thanksgiving with more detail than Ann McGovern’s book reviewed above. This book is structured around a series of 49 questions such as “Were Pilgrim parents strict?”, “What did the Wampanoag Indians wear?”, “Who was in charge of the cooking?”, “Were there enough tables and chairs?”, and “Why didn’t the Pilgrims serve pumpkin pie?” Regardless of what my kids learned, I have to say that I learned so much from reading this book! Young history buffs will be fascinated with the information shared about Pilgrim and Indian life at the time of the first Thanksgiving. Beautifully illustrated, this history of the first Thanksgiving day is told in cumulative rhyme. Young readers are introduced to the Pilgrims who “steadfastly labored and toiled by hand,” the Indians “who knew how to live through the winters so long,” the Mayflower ship “that weathered the rough seas, the wind and the hail,” and the first Thanksgiving food, “gathered and blessed.” This book does a lovely job of presenting the history of the first Thanksgiving day in a way that is accessible to young children. The main challenge I faced when read it was that my kids had so many questions that it made it difficult for me to stay with the rhyme and rhythm of the story. Although beautifully illustrated, I preferred the two books reviewed above for a factual account of Thanksgiving. Tuyet is a Vietnamese-American girl who is very excited about the upcoming Thanksgiving holiday. Her class at school has been singing songs about turkeys, making turkey crafts, and learning about the Pilgrims and Indians. To her dismay, however, she discovers that her family plans to eat duck, not turkey, on Thanksgiving. When she returns to school after the holiday, she is embarrassed to tell her teacher and classmates that her family did not eat turkey. But then she discovers that she wasn’t the only student who didn’t eat turkey. Among her multicultural group of friends, some ate lamb, roast beef, enchiladas, and even a tofu turkey! Tuyet’s teacher help her understand that the true meaning of Thanksgiving isn’t found in the type food on the table, but in being with family and friends. Each year on Thanksgiving, Grandma Grace puts out a Thanksgiving Bowl to collect a note from each family member about what they are thankful for. But in the rush to clean up from Thanksgiving dinner, the bowl is knocked to the ground outside. Over the course of a year, the bowl moves around and blesses all that come in contact with it. For example, the bowl becomes a shelter for a field mouse trying to avoid the talons of an owl, a hat for the snowman two boys are building, a nest for a mother goose, a pot for a girl’s plant, and more. Finally, the bowl makes its way back to Grandma Grace’s house just in time for the next Thanksgiving, allowing the family’s thankfulness tradition to continue. Ed and Ann are an elderly couple who had planned to eat Thanksgiving dinner at home. But when Ann burned the dinner, they decide to go out to eat. They walk to the new family-owned restaurant down the street, and finding the door open, they walk in. Unbeknownst to them, the restaurant was supposed to be closed that day for a large family dinner. The young children of the family conspire to scare away the visitors, but the family matriarch won’t hear of it. She insists that her family share their Thanksgiving dinner with the two strangers. What happens next is a joyous feast and celebration that becomes a Thanksgiving to remember. Miguel is a young boy who lives in New York City. His father is gone for long stretches of time working as a truck driver. One day Miguel’s father sends Miguel a present. It is a turkey with a note to fatten the turkey up for Thanksgiving so the family can enjoy Thanksgiving dinner together. Miguel names the turkey Gracias, the Spanish word for “thanks.” He cares for Gracias week in and week out, growing very fond of the bird. Eventually, Miguel realizes that he cannot bear to eat Gracias for Thanksgiving. But it is hard to keep Gracias in a New York City apartment, so where will Gracias go? At the end of the story Miguel gets to see his father for Thanksgiving and Gracias gets a new home that makes everyone happy. With similar rhyme and a story that faintly echoes the famous “‘Twas the Night Before Christmas,” Dav Pilkey recounts the adventure of students who take a field trip to the local turkey farm. But the students are horrified when they hear that the friendly turkeys they meet will soon be killed for Thanksgiving dinner. So the students hatch a plan to abscond with the turkeys. In the end, the turkeys are saved and become guests of honor in the homes of the students for Thanksgiving. This adorable story with rhyming text is told from the perspective of a young child enjoying Thanksgiving. The narrator details everything that happens on Thanksgiving, including visits from friends, watching parades, dressing as Pilgrims and Indians, playing football, and enjoying a Thanksgiving meal. Young children will enjoy seeing some of their own family traditions mirrored in the story. Two pilgrim brothers set out to find a turkey to pluck and stuff and gobble up for Thanksgiving. But while the big pilgrim brother has his heart set on finding a turkey, the little pilgrim brother isn’t so sure that turkey is what he wants. While the brothers continue their search, turkey is doing his best to hide. His animal friends help him out along the way, but their hiding suggestions are not very effective. Fortunately for turkey, the little pilgrim pretends not to notice turkey and continues to steer his brother away. Young readers will laugh at turkey’s bumbling attempts to hide and will be delighted with the solution little pilgrim comes up with! Mr. and Mrs. Moose are preparing to host Thanksgiving dinner. They set out chairs for their guests. They put out their decorations, including a paper turkey. Then Mrs. Moose sighs that she wishes they had a real turkey for Thanksgiving. So Mr. Moose, with help from his friends, sets out to find a real turkey. When they finally find a turkey, it tries to run away. But Mr. Moose and friends catch him and drag him home to Mrs. Moose. Much to the turkey’s surprise, however, he ends up as the guest of honor rather than the main course! You’ll find more Thanksgiving ideas on my Thanksgiving Activities for Kids page and my Thanksgiving Pinterest board. Follow Gift of Curiosity’s board Thanksgiving on Pinterest. This is a wonderful list. We read several of those books (some this year) and love them. Thanks for sharing your picks with Afterschool! You should check out a book called 1 Little, 2 Little, 3 Little Pilgrims.” It is really accurate depiction of the lives the Wampanoag Indians and the Pilgrims lived while being very early childhood friendly! It’s my favorite “first” Thanksgiving book. Ooh, I haven’t heard of that one but I will check it out! Great list. We’ll be looking to get some of these from the library! Great list of books. Some we will check out soon. Thanks for sharing at Sharing Saturday!